Leaders are fundamentally charged with getting things done – being productive. To do this, we have to understand that time is every organization’s most valuable asset. 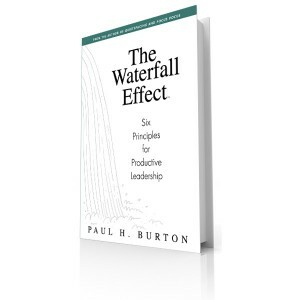 When leaders spend their time focused on the right goals, engaged in the right activities, and with the right people, they produce the Waterfall Effect. The Waterfall Effect is the benefits that cascade down through the organization, into the community, and out to the customer/client base. Developing Field Vision – the ability to assimilate and respond to numerous data inputs. Keeping the Glass Half Full – the impact of attitude at the leadership and managerial level. Leveraging the Value of Silence – the timing of when to talk and when to remain quiet. Peeling Back the Onion – the value of uncovering the hidden potential in others. Setting the Bar – the importance of setting and maintaining proper expectations. Triaging Priorities – the need for constant appraisal of what needs doing right now. This book covers all six principles in detail, providing you 18 concrete suggestions wrapped in examples, exercises and stories to drive the point home. Imagine, in under an hour, you could be producing the Waterfall Effect every day!